Yesterday afternoon I received a Facebook message from a local TV reporter who is a friend of mine on social media channels. She indicated that she had seen my post about our first Acts of Kindness challenge and was so intrigued with the idea of Promise Monsters that she invited them to the station for a segment! Isn’t that great? I’m so glad this local company is getting more attention. 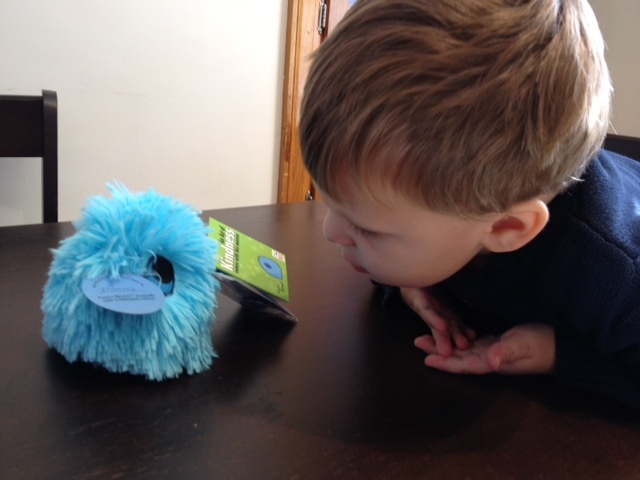 The funny thing is – about 5 minutes after I received the Facebook message, our postal worker, Mr. Jason (who’s great, by the way), delivered our next Promise Monster to our doorstep! Talk about timely. Meet Spike. Spike is a mess – but in the best of ways! 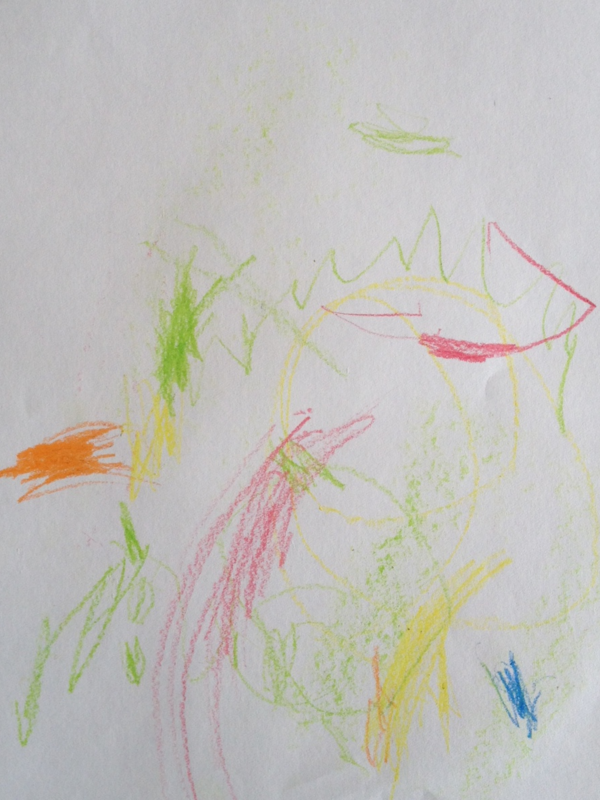 He’s very creative and good at expressing himself, and has no fears. Wes was ecstatic to meet Spike. He loved his quirky shape instantly. He asked me to open the mission card immediately to find out what Spike had challenged us to do. 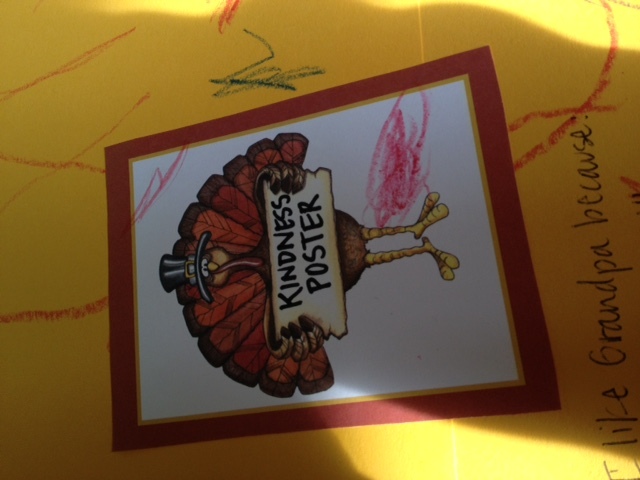 Hurriedly, we learned that we were to create a kindness poster that would surprise and spread happiness to those that saw it. 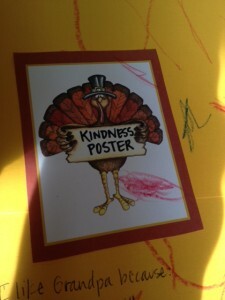 Getting excited, we headed to the basement to find our materials for Spike’s kindness poster. Locating stickers, scrapbook paper, crayons and markers, we gathered around the kitchen table to start our project. 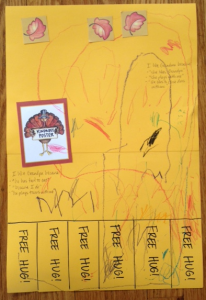 We thought about what would make Grandma and Grandpa happy and decided to make coupon tear-offs to redeem for a free hug from Wesley. He thought that was pretty clever and then decorated the poster with rainbows. 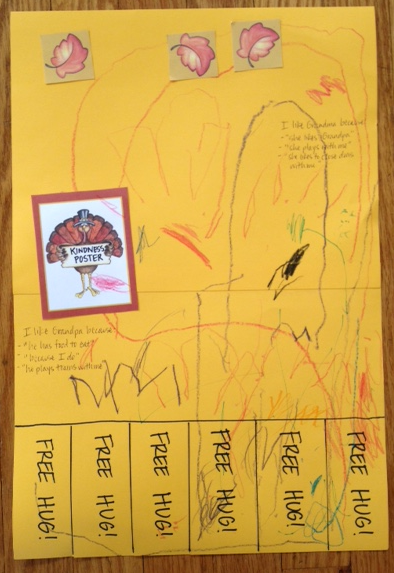 Since it’s Thanksgiving time, we found some season-appropriate stickers to add to the poster and talked about what we were thankful for in both grandparents. 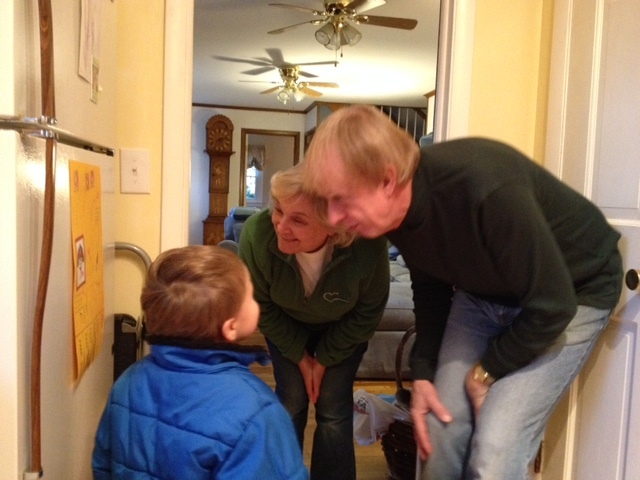 He was excited to surprise his grandparents with Spike’s kindness poster. We had already made plans to drop Wes off at my parents’ house that evening anyway, so we knew we could surprise them in the very near future. 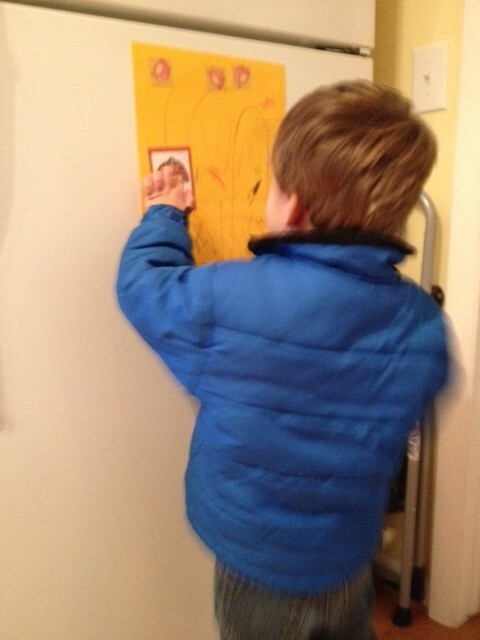 Once we arrived, Wes promptly walked into their kitchen and hung it up on their refrigerator. And boy, were they ever surprised! At this point, I had to explain the premise and the purpose of the project, and they instantly loved it. They crouched down to look at it more closely and oohed and ahhed at Wes’ creation. Wes was so pleased to see his grandparents so happy. 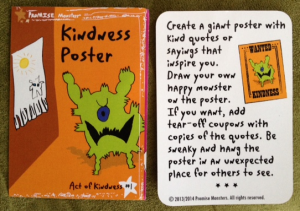 And he knew that the kindness would continue for days – every time they see the poster and every time they “redeem” a coupon. It brought a huge smile to all faces in the room. Thanks, Spike, for a great idea! 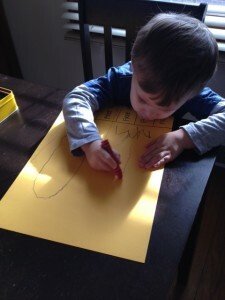 Obviously, this project was adapted for a 3-year-old’s small social circle and abilities. But even then, his efforts were well received and appreciated. I’d call that a mission: accomplished! Once again, Promise Monsters have entered our lives at a very opportune time. At church, we just finished our sermon series, Love Indy, on spreading kindness to our neighbors and community. And now that Thanksgiving has recently past, we have been more aware of our blessings and gratefulness. Spike’s challenge rekindled that special feeling you get when seeing others smile; it helped to make appreciation, gratitude and “paying it forward” more of an occurrence in our lives. Wes hasn’t yet chosen his reward for completing Spike’s challenge, but from the looks of it, he’s gonna love the choices – Spike’s accessories like socks and stocking cap, to name a few. A small incentive, yes, but well worth the price. Everyone wins! As we approach the holiday season, I highly recommend a fun gift like Promise Monsters. Watch a little person do something big for someone else. It’s a wonderful experience. 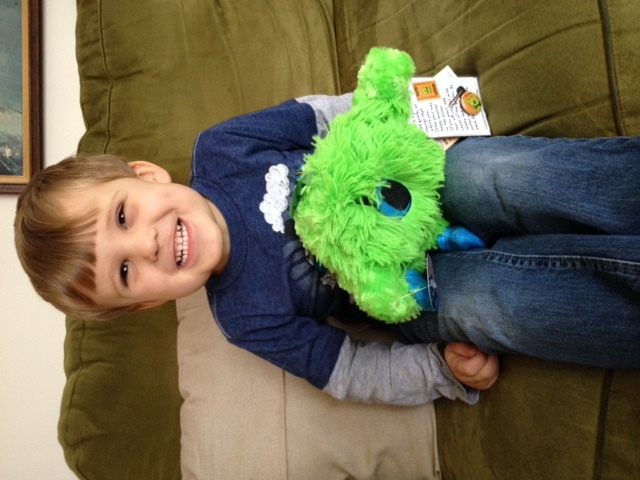 Our family has been chosen to blog about our experiences with Promise Monsters, an Indianapolis company creating toys that encourage spreading kindness to others. To view all related posts, click here. I’m really getting into the holiday spirit this year, and it’s only mid November. I feel sorta bad for Thanksgiving because it’s not getting my full attention – I’m going straight to the fun Christmasy things. Oh yes. 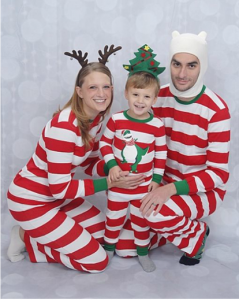 We did an Awkward Family Photo shoot in matching holiday pajamas and corny head gear. It was great fun, and we’ll use some taken for our Christmas card this year. The best part was the photographer’s reaction. She giggled the whole time and kept referring to us as “Where’s Waldo,” which, of course, does resemble our outfits, but that’s totally not the point. She nearly insisted that we put “Where’s Waldo? !” under the “Merry Christmas 2014” on our free Christmas card prints, and I nearly let her. And then we shopped normally around Target for the next 45 minutes and only got thumbs ups and “Aweseome!” from the fellow shoppers. 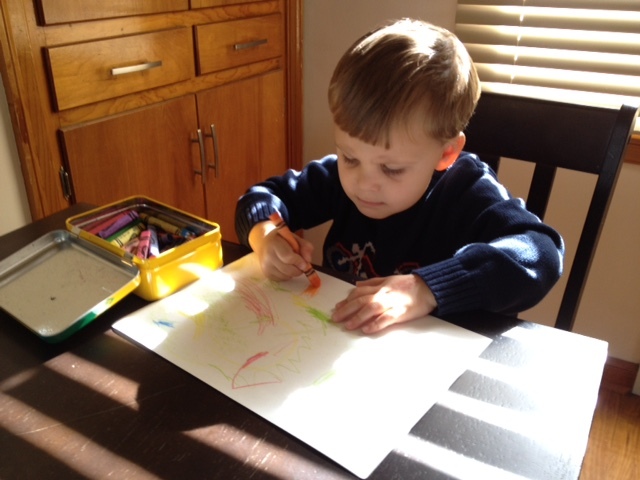 Wes is 3, and while the past Christmases have been fun with him, this year seems different because he’s old enough to experience and comment and participate in a way he wasn’t able to before. And, heck, I’m able to relive some of the holiday excitement and wonder that I remember as a child through the eyes of my son. It sorta got out of control, though. I would buy/acquire things outside of his age range because apparently that would make him seem “more mature” and unlike other kids his age. (This is another post for another day…why do we feel the need to MAKE our kids different than every one else? Religion and faith is one thing, but do kids really need to be cool or hipster?) My kid would be sophisticated! And then, well, it dawned on me that I was aging my only child too quickly. Three years isn’t that long, but Wes is already outgrowing his little boyhood. He wants to be independent and desires less and less of mama-snuggles and affection. Though, thankfully, it hasn’t been lost forever yet. There is plenty of time to grow into non-Duplo, regular LEGOs. 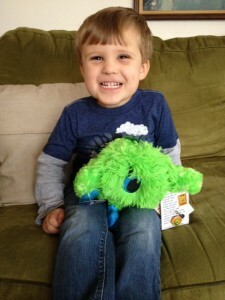 There is plenty of time to introduce him into Star Wars, Teenaged Mutant Ninja Turtles, video games and big kid bikes. There is plenty of time to educate him on green, local goods & services. As I’ve been Christmas shopping, I’ve kept this in mind. Some of things that I thought we would put under the tree will wait another year because, well, Wes is still 3. 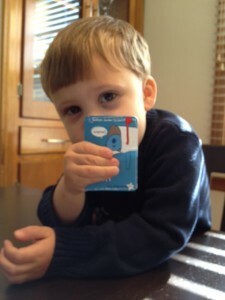 He likes Thomas and Friends, Daniel Tiger, Curious George and Clifford. And rockets and dinosaurs. And there’s nothing wrong with that. I’m letting him enjoy what he likes right now, and I’m embracing his interests. They’re HIS presents, right? Not mine. He’s going to flip out. Who wouldn’t love a Thomas the Train indoor roller coaster?! 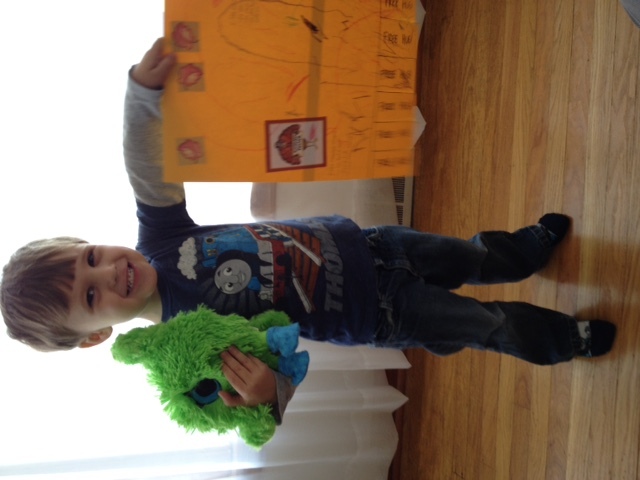 I’m so excited to announce that our family was chosen to be Promise Monster Ambassadors for the next several months. Promise Monsters is a family-run toy company based in Indianapolis, Indiana, (yay for local artisans!) 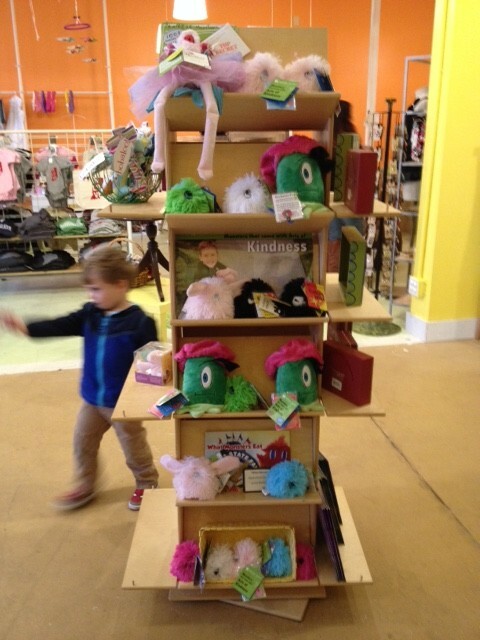 that sells toys and other products that all spread kindness! All of their monsters come with an act of kindness for the receipents to complete. When completed, a reward is mailed to the do-gooder. 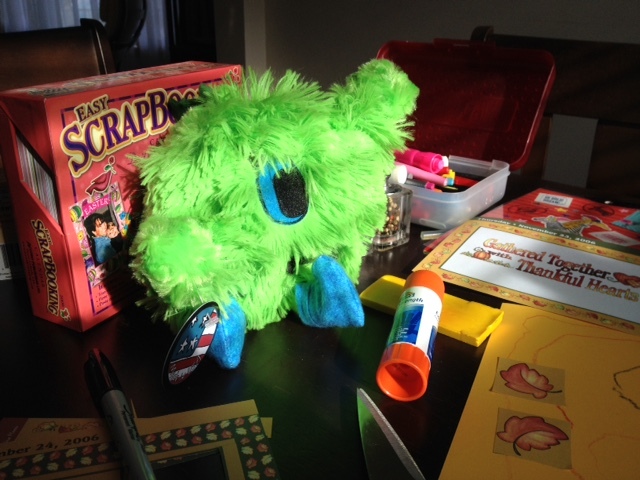 I have gifted these cute little fuzzy monsters (all designed by childrens’ drawings) to several friends’ kids, as it’s a great way to support a local company and give a present that will pay it forward. It’s fun to see shared stories and photos of completed acts of kindness on their website. We were chosen to receive a handful of Promise Monsters and blog about our kindness missions. This comes just at the perfect time when our church congregation is embracing the community through our Love Indy sermon series. We are encouraging each other to reach out to those we might not otherwise, pray for opportunities to serve and lend a helping hand with simple acts of kindness. 1 John 3:16-18 — This is how we know what love is: Jesus Christ laid down his life for us. And we ought to lay down our lives for our brothers and sisters. If anyone has material possessions and sees a brother or sister in need but has no pity on them, how can the love of God be in that person? Dear children, let us not love with words or speech but with actions and in truth. Wes is at an age where he understands the importance of helping others and the fulfilling life it leads. If we are to live like Christ did, we should be doing more for others – not out of “duty,” but out of genuine love. 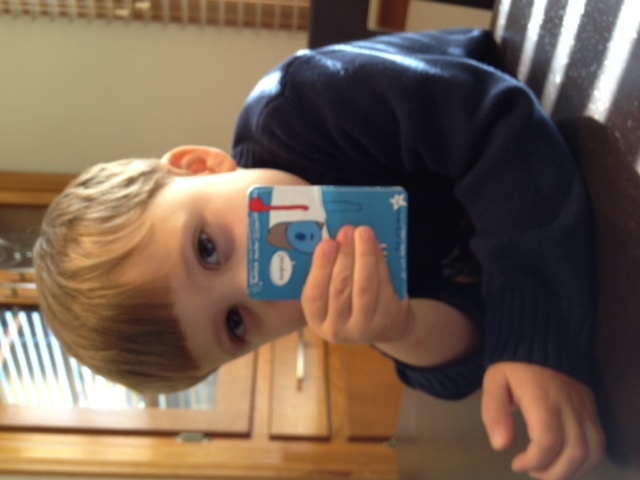 Why not start teaching him how to be kind at an early age so that it comes more naturally to him as he gets older? We received our first Promise Monster yesterday. Meet Blue Smarshmallow! All Promise Monsters are handmade in Indianapolis. Ours was made by artisan Xiomara. Blue Smarshmallow is a sentimental guy who cares about people and loves to let everyone know how much he loves them. He had a special mission for us. Oh, fun! We were challenged to send a letter to someone and tell them how special they are to us. 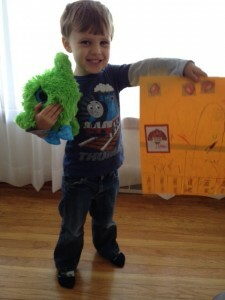 Wes selected Pa Shattuck, Steven’s dad, as the lucky recipient of happy mail, and we pulled out some paper and crayons. While Wes was busy drawing his picture for Pa, I helped him write the letter. “What do you like best about Pa?” “What would you like to tell him?” The result was perfectly cute and bound to bring some joy. Dear Pa, Happy Birthday! (It’s not his birthday yet, but it’s somewhat timely.) Um, shark. I like you and your M&M’s. I like the color red. You make me happy. I like you. Do you like the color black? Do you like green? I like green. I like Pa! You give good hugs. I like Pa. Do you like red? I made you a sun and thunder – the sun is going down and thunder is coming! – in this picture. With love, Wes. I don’t know where “shark” came from, but he giggled about it. 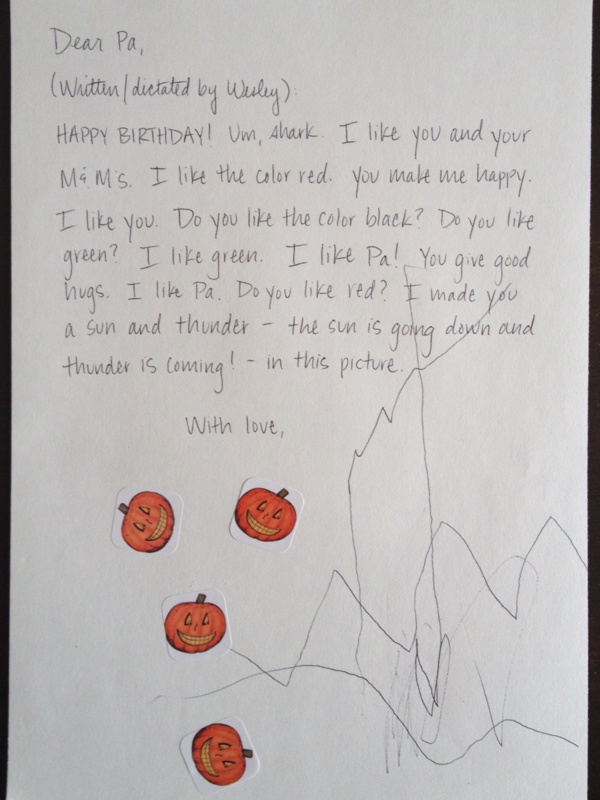 Granted, we completed this project just before nap time, so he probably would have put some more thought and detail to this letter and picture if we had picked another time, but he happily worked on his mission, knowing it would bring a smile to his Pa’s face. He also knew that once completed, Wes and I would type in our secret code given to us from Blue Smarshmallow to select his mission-completed reward. The anticipation made the project all the more fun. 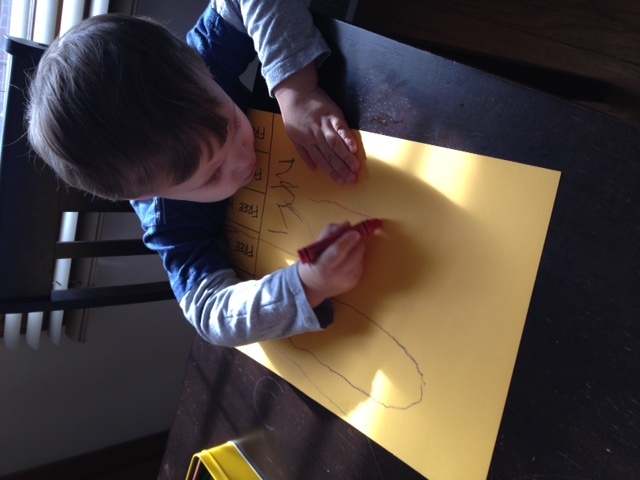 He’s anxious to put the letter in the mail tomorrow and wait for Pa’s surprised reaction. We decided that Blue Smarshmallow would be a welcome addition to nap time (he’s sleeping with him as I write this), as he’s now part of the Shattuck family. What a fun and simple thing to do. 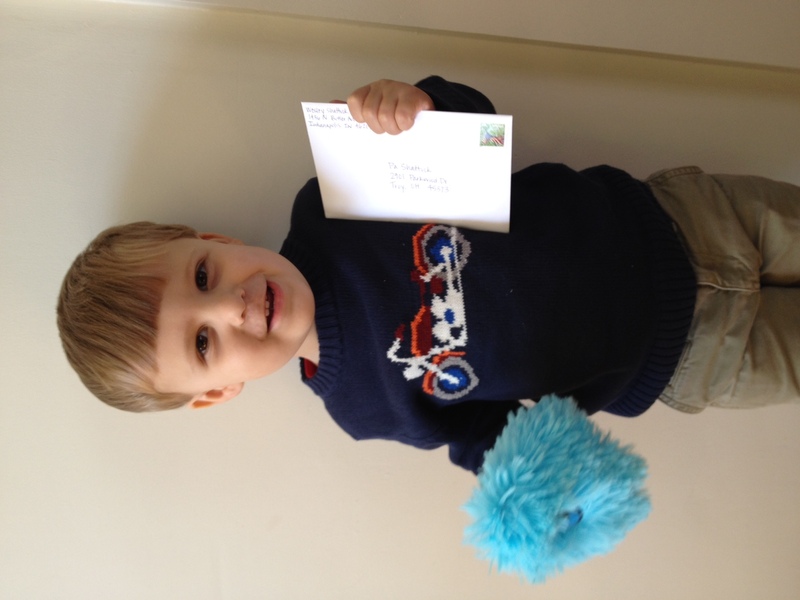 Receiving a special letter from someone really does put a smile on your face, doesn’t it? Especially when sent by a goofy preschooler! 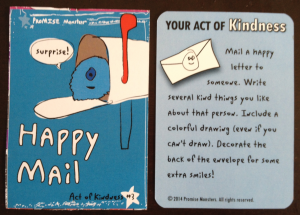 Sure, you don’t need a Promise Monster to create “happy mail,” but Blue Smarshmallow brought the idea to our attention when it hadn’t been planted otherwise. 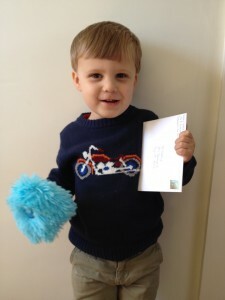 And now, perhaps Wes will want to send happy mail to other people, and more often! Knowing how well Wes recalls information, he will likely refer Blue Smarshmallow with the letter written to Pa even months from now, which will be an easy prompt to do it all over again. I’m looking forward to our next kindness missions and sharing our experiences here. I do hope you’ll consider looking at Promise Monsters for the kids in your life, too. Not only are they adorable fuzzy friends that just happen to be local!, but they also encourage simple acts that we can incorporate into our daily lives to make our community a loving and better place. Check them out online or at various storefronts like Little Green Bean Boutique, Black Sheep Gifts, Kits and Kaboodle or Imagination Station (more locations are listed here). I’m planning to snag a few for my nieces and nephews for Christmas this year! Edit – we just realized the reward for the Smarshmallows is included in the shipment. The rewards for the larger monsters, however – you get to pick (and they’re great, too, like superhero cape accessories for your monster)!